Visions of Kyle Reese guide the injured Sarah. This episode takes place almost immediately after the events of "Earthlings Welcome Here". At the beginning of the episode, the voice of Kyle Reese is repeating words he told Sarah (with some additions) in The Terminator. Sarah and her visions of Kyle trade quotes from the film throughout this episode. Sarah's hospital chart at 1:36 on the Blu-ray states that she is at Calico Hills Hospital after suffering a gunshot wound in the leg in "Earthlings Welcome Here". This appears to be a fictitious hospital. The sheriff's deputy guarding Sarah's room has a shoulder patch for Muir County, suggesting this is where the hospital is located; this is a fictitious county of California. The vision of Kyle that Sarah sees throughout the episode is dressed in the same clothes he wore throughout the 1984 scenes of The Terminator. The sheriff's deputy appears to be carrying a Glock 17. Sarah knocks him out and takes the gun from him, carrying it throughout the episode. Dr. D'Costa's lab coat at 4:42 on the Blu-ray has a patch on the breast revealing that the hospital Riley is in after her suicide attempt is Bradley-Hahn Medical Center. This also appears to be a fictitious hospital. Dr. D'Costa tells John that he is obligated to place Riley under a 5150 medical hold for the next 72 hours while a CPS caseworker makes a judgment on her foster care situation. Section 5150 is a section of the California Welfare and Institutions Code that allows for the involuntary psychiatric hold of an individual by a doctor or law enforcement under suspicion of a mental disorder. CPS is Child Protective Services, a state governmental agency that provides protection to minors under threat of abuse or neglect. At 5:04 on the Blu-ray, Sarah is outside of Providence Holy Cross Cancer Center. This is an actual California-based cancer center, with locations in Mission Hills and Santa Clarita. The ambulance seen at 7:11 on the Blu-ray is a 2008 Ford F-Series Super Duty. The car parked next to it is a 1986 Oldsmobile 98 Regency. The old shoulder wound seen on Sarah's left shoulder at 9:49 on the Blu-ray is seemingly meant to be where the T-1000 stabbed her near the end of Judgment Day, but in that film, she was stabbed in the right shoulder. At 15:12 on the Blu-ray, the clock in Sarah's motel room tells us it is currently 2:13 (p.m. since it is still daylight). In her vision during this scene, Sarah tells Kyle she is going to die and he responds, "It won't be the first time." Is this a reference to Sarah's death from leukemia in the Rise of the Machines timeline(s)? 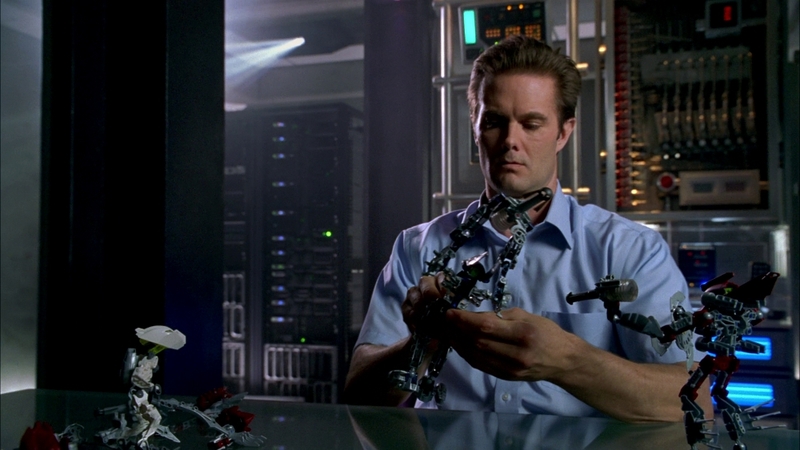 At 17:08 on the Blu-ray, John Henry is seen playing with action figures from the Bionicle toy series made by Lego. The characters he is playing with are Solek, Toa Gali, and Toa Tahu (in his Tahu Mistika form). John Henry's description of Toa Tahu here and, later, of Solek, are roughly accurate of the characters. As John Henry tells of the origin of his humanoid body, shots of George Laszlo (the actor whose likeness the body is based on) from his film Beast Wizard VII (from "The Mousetrap") are seen on the monitor screen next to him. John Henry states to Weaver that Zeira Corporation has gained control of 7 percent of the world's coltan supply. In "Heavy Metal", it was learned that coltan is an important component of the metal of a Terminator endoskeleton. As Sarah and Dr. Burnett exit her car to the hospital at 21:06 on the Blu-ray, a car parked in the lot (Honda Civic?) has CA license plate 2QCE265. This is a prop plate seen in a number of Hollywood productions such as Law and Order, Knight Rider (2008), and Iron Man. At 24:18 on the Blu-ray, Derek's Dodge Ram suddenly looks much dirtier than it was just a second before! Riley tells Jesse about a girl at school who killed herself whom John had tried to help. This is a reference to Jordon Cowan, who jumped off a school building and killed herself in "The Turk". The urinals seen in the restroom at 31:44 on the Blu-ray are made by Kohler Co. The shot of the man using the urinal is probably meant to recall the scene in "Samson & Delilah" when the urinal used by Justin Tuck is suddenly shown to be covered in the polymimetic alloy of the Catherine Weaver T-1000 just before she kills him. Here, the urinal is just a urinal; Weaver walks past him and kills him as he is exiting the restroom. The shot of the Weaver liquid metal Terminator emerging from the flames of the warehouse explosion is very similar to the shot of the T-1000 emerging from the truck explosion in Judgment Day. The metal box Kyle digs up from near the tree in Sarah's dream at 37:48 on the Blu-ray is a military ammo storage box. However, the box is labeled as containing "Blank M200 Cartons". In most cases, the military would not be using blank cartridges, even in training. It may be that the box was from this or another film or television production, which does use lots of blanks in gun scenes. At 39:15 on the Blu-ray, what appears to be a Christian cross is seen hanging on the wall of the hospital morgue where Dr. Burnett has removed the bullet from Sarah's leg. After Dr. Burnett shoots Sheriff McKinley, he falls to the floor next to a Hausted gurney. How did Sarah wind up at the hospital after being shot in the leg in "Earthlings Welcome Here"? The most likely explanation would seem to be that she drove herself there with the intention of kidnapping a doctor to remove the bullet (which she later does) but fell unconscious and was taken in.